Eight people are lightly wounded, no casualties. Luckily, the damages are a lot more minor than expected. The direst of the disaster is the direct route that has collapsed, but it’s completely repaired on the second day, and three days later, the rubble is all cleared up. We decided to keep this ‘mysterious room’ we found during the repairs from the villagers. This decision is made by the Chief. He feels it is better to investigate first before revealing. And on the fifth day after the earthquake. The girl straightens her little back, stating her name. I pat Vicia’s head, “ehehe” and she grins gleefully. Splash. There’s the sound of hands being washed, and Viscaria, dressed in white clothes, show up. Viscaria nods away, moving her feelers. Vicia lies on the bed, giving an uneasy look. 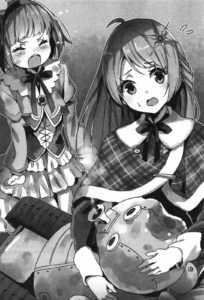 “It’s okay.” Viscaria gives a tender look at the girl’s face. Viscaria comforts the girl who still remains somewhat uneasy, giving a motherly smile. To note, there are three main circuits in a robot. The ‘Mind Circuit’ is basically the human brain, which acts as the control tower for the entire body. The ‘Control Circuit’ is basically the equivalent of the nerves and spine, able to spread the commands from the Mind Circuit all over the body. And then, there is the ‘Safety Circuit’ to prevent both Circuits from going amok. Vicia’s voice becomes interrupted, and finally, the light in her eyes vanish. Once Viscaria is sure that her Mind Circuit is in sleep mode, she starts to investigate. She rolls up the girl’s shirt with her metal feeler, revealing the white belly, and gently inserts into that cute bellybutton. A little twist, and with a little creak, Vicia’s abdomen is opened right down the middle. Viscaria checks the girl’s body with a serious look. The feeler extending from her fingertip twitches like a living creature, peeling off a translucent membrane, revealing the inner circuits. She says, lighting a light from the tip of her feeler. It’s somewhere to the inner side of Viscaria’s belly, as the battery unit has been distorted like melted plastic. I head into the room, and look up at the parts cases that are stacked everywhere and built to the ceiling. The replacement parts for the villagers’ bodies are filled completely. In terms of importance to the village, this warehouse is second only to the Snow White. I recite it out loud, and one of the shelves light up. A faint translucent blue drawer slides out automatically, indicating that what I’m looking for exists. I draw out a silver baumkuchen-like part, and return to the diagnosis room. I look at the part by the bed that is completely deformed. This is the ‘infected part’ taken out from Viscaria’s body. It’s so twisted that it is impossible to think of it as the same part. It’s basically telling the pain the girl suffered, and my heart aches. After Vicia’s operation is done, we proceed to diagnose another ten or so, and the morning work is finally done. Viscaria slumps into the sofa, letting her neck creak. Waste materials will gather in the Mind Circuit of the robots keep focusing their attentions too much, corroding it. Viscaria is basically the expert in technology, so we just end up leaving everything to her. We can probably install her repair manual in us like a pill, but we probably will freeze up due to a lack of specs. Over the past hundred years, we have been providing maintenance and care for the ‘Snow White’, for the ‘Spindle’ of the main computer, the ‘cradle’ of the masters, and the ‘REM forest’ that contains the Snow White—every day, we made checks, cleaning and repairs on them. But no matter how well we manage to maintain them, the ‘Snow White’ is still a large piece of metal. Its body is slowly being corroded, breaking down. And so, on a certain day seventy years after we went underground, the spare parts to repair the Snow White have finally worn out. We didn’t know what to do. If this kept up, the Snow White would malfunction. Our beloved masters would die. Is there any way to obtain the parts—after thinking so hard, we finally thought of one. We extracted the parts that form a robot’s body, refined them, and used them on the Snow White, so that the maintenance of the Snow White could continue. In this sealed underground world, where resources are limited, there was no other choice. But there was undoubtedly an issue to this. Robots that had been ‘extracted’ would be unable to move due to the defects of their parts. To resolve this issue, we used ‘replacement parts’ made of similar materials to replace the parts that were ‘extracted’. The villagers’ bodies were then replaced by replacement parts every passing day. —And once everything is switched to replacement parts. Viscaria once explained this to us. —They aren’t parts of official specifications, so no matter how we try to process them, they will not mesh perfectly, and the rate of deterioration will be hastened. Thus, patients who have been ‘extracted’ will malfunction easily. Even so, the villagers rushed forth, hoping to be ‘extracted’. I too have seventeen parts swapped with ‘replacement parts’, two on the head, two on the right hand, three on the left hand, one on the right leg, two on the left leg, and seven on the body. At first, the ones who offered to be extracted was limited to just adults, and in the end, even the little children bravely offer their parts. At this point, a child has an average of 4.2 parts extracted, while an adult has an average of 11.3 parts. Pin pon pan pon. The cowbell-like chime rings, indicating the end of the rest period. Viscaria gets up from the sofa, and adjusts the collar of her white robe. A young girl’s voice rings. And then, it’s followed by a familiar “Gaaa peee.” Noise. Viscaria and I exchange looks. Viscaria lowers her beret, and shrugs. After that, another two weeks pass. The lights shine upon the ice-carved stage, creating a dazzling crystal effect. The center of the arena is filled with a scattered-style audience seating, as the three hundred plus villagers are all gathered here. The prayer festival we awaited is finally here. The passion brimming from the audience reaches the stage, as though trying to melt it. The festival is going to be held from morning to night, and all work is suspended. I too intend to enjoy the festival before it’s my turn to ascend the stage. This rare relaxation time I finally have is ruined by this flirting guy. “Hey, stop touching me.” “Ehehe.” So this exchange continue on over and over again, and in the blink of an eye, it’s time for the performance. A sextet happily blow the trumpets “Kept us waiting!” “It’s here!” “Heerrrreee!” and the audience roar into life. There are shrieks in this fiery atmosphere. With a beautiful voice, the host Cattleya announces the start of the festival, and the audience burst into cheers again. And amidst the thunderous applause, Chief Chamomile shows up on the stage. The way his head rolls around on the stage is as terrifying as a zombie in a horror flick. He repeats the greeting that remains the same for over a hundred year, “Chief! !” “You still doing okay! ?” “So cute! !” and voices can be heard from the audience. The Prayer Festival is a traditional festivity with a hundred years of history. At first, it’s simply a yearly ritual to offer ‘prayers’ to our Masters, but as time passes, there is singing, dancing and all kinds of entertainment involved. In this sense, while it is to provide entertainment for the villagers who have lived underground for a long time, the main purpose is to train their ‘talents’ such that the acts can be performed to the masters once they awake. The programs are graded according to voting, and the basis of the voting is decided on “Can it make our masters happy”. Once the Chief’s address is done, the staff will clean up the screw and screwcaps on the stage (these will be returned to their masters once done), and then, a trumpet’s cry signals the start again. As Cattleya’s beautiful voice rings, a man and woman appear on stage. One of them is Miss Ceolaria, who has the appearance of an eighty-year-old domestic robot. She’s the ‘replacement robot’ created by a husband who lost his wife and wanted to alleviate his loneliness, and she continues to live even after her master died. The other, Mr Curl, once worked in a famous orchestra, and is now the premier musician in the village. “I’m really nervous to be chosen first. Now then, I shall perform the ‘Spearmint Genesis’ my deceased husband loved. Miss Ceolaria bows elegantly, and the crowd immediately burst into applause before becoming silent again. There’s no commotion, as everyone knows that it’s time to be silent. As her partner, Mr Curl carries his signature electronic viola, and stands diagonally behind her. The uninterrupted melody of the viola flows out, and Miss Ceolaria starts to sing. Before humans are born, in a time far beyond. The many messengers of god, appear in the sky. With tears in eyes, they became rain of grace. Thus the seas are born, the seas are born. With a clear yet despondent voice, she sings a hymn that reveals how the world is born The arena is engulfed in a solemn atmosphere, and everyone feels melancholic, gloomy. Miss Ceolaria’s program has never changed over the past thirty years, but whenever I listen to it, it just feels so new, the first time I have heard it. Once the singing and performance are over, a thunderous applause rain upon the stage again. Both of them bow, and return to the side of the stage. —This is a nice song..
As I narrow my eyes and enjoy the lingering emotions, Cattleya’s voice rings again. Pairs of male and female perform songs, dramas, skits, magic shows, manzais, impressions—there are classic shows we are familiar with, and new shows; the atmosphere at the arena remains as lively as ever. I remain in the audience, cheering from time to time, and squashing Eisbahn’s lecherous hands from time to time. It has been two hours since the performance started. I lean my body towards the stage. The backdrop changes into a grassy field similar to a kindergarten, and Daisy shows up, riding on Gappy. “Ahahha!” “It’s Gappy!” “It’s Scrappy Gappy!” and the children burst out laughing. Daisy slaps Gappy on the head, and it causes the audience to laugh again. Daisy rides on Gappy, who looks like he’s going to collapse at any given moment, and kicks his chest. Gappy slowly moves forward in a clumsy manner, the caterpillar legs letting out a creaking sound. The host Cattleya announces, and a ‘wall’ carved out of ice is moved onto the stage. On first glance, the wall is at least three times the height of Daisy. It’s really unbelieve to think that she would be able to jump across while riding Gappy. The audience too break out in murmurs. “Jump over that thing?” “You’re kidding, right?” “No can do.” There was such a discussion. But Daisy herself gives a confident look, and has Gappy retreat. It probably looks like a running start before they jump. I stand up. If they end up crashing into the wall, there’ll be trouble. The flirting guy beside me grab my arm, “Hey, let go already.” I glare at him. Eisbahn points at the stage. Well, it’s true that there’s something thin laid out somewhere on the grassy patch. I then sit down again. If Eisbahn’s right, I would have ruined this program if I went out. The crowd is bustling. I narrow my eyes, and see that the running start has begun. Gappy’s caterpillar legs spin intensely as the sound of friction echoes, and sparks look ready to fly as they charge towards the wall. What will happen, how will this end up—with bated breath, everyone watches this reckless challenge, and at the moment they’re about to crash into the wall—Gappy’s body sinks, and the rebound causes them to jump up. It’s supposed to be a jump several meters high. Unfortunately, both of them lose their balance and end up ‘flying forward’, falling head first into the bottom of the stage like a rubber ball, thunk, thud, loud noises follow. I pick up Gappy, who remains motionless, “Ga-Ga-Gappy…” he groans weakly, the hemispherical head sinking in hard. I find Daisy beside me looking utterly furious, her face flushed. It seems she’s lightly hurt herself. Gappy tries to refute as he remains in my arms. Daisy widens her eyes, her body shaking in anger. After that, the girl runs off without looking back. Even after the break, Daisy shows no signs of returning. I want to go look for her, but I can’t ignore Gappy who’s giving off smoke. So I bring Gappy to the infirmary. “This is really some injury.” Viscaria slowly notes once she sees Gappy. And so, Gappy’s repair ends up taking up more than two hours, and I stay by his side the entire time. Daisy’s stubbornness really is troublesome…I mutter as I leave the infirmary, as the morning performances are coming to an end. It’s almost my turn, so I quickly hurry to the seat. Eisbahn gives me a gleeful look, his legs resting on the seat before him. And I show no attempt to hide my contempt as I sit with a thud. I proceed to knock the blond on the head. Cattleya stares at the paper in her hand, taken aback. I grab him by the chest, and shake him head. I recall the words Eisbahn said when he sat next to me. He did say he has a deal with the Chief. Cornered, I glare at this flirt before me. “Call me a strategist.” He chuckles. I smack this pervert on the head. “Miss Amaryllis! Mr Eisbahn! It’s time!” Cattelya exclaims. It’s bad. If this keeps up, I’ll be disqualified. This prayer festival happens once a year, and if I get disqualified without being able to do anything, I can’t explain to our masters. But if I have to give this fellow a deep kiss…! While I’m feeling troubled, “Well then.” He raises his eyebrows. It’s a lot better than kissing, but. Eisbahn smiles confidently, and gives me a nudge from behind. I just feel that I fell into a trap, or so it seems. The white light shining down the artificial crystalized stage swallows the entire stage, giving the impression of it being under the sun. The stares of the audience are like sharp arrows piercing through my heart, and I can’t help but freeze up as I’m nervous. I open my lips slightly, making sure my voice isn’t obvious trembling. To be honest, I really feel uneasy about the sudden change of partner. This Festival only occurs once a year. If I fail, I won’t have the chance to salvage it until the next year. He shows no tension at all, and my heart has a strange feeling, wondering if I should hate him or hate. The music echoes on the stage, and we’re surrounded by the sad melody of the instruments. The duet is finally going to begin. Sleep well, sleep well, sleep well for today. I put my hand before my chest, holding in my tension as I sing. And shockingly, Eisbahn’s voice echoes perfectly with mine. I shall continue to hold you in my arms, so sleep well. The singing continues, and I can’t help but show surprise at the partner next to me. It’s a powerful voice, audible enough, a singing style that perfectly controls the essential points of a man’s voice. Everything, and anything, is for, you. That is why, sleep well, for today. Until, the day, you wake up again. It’s like driving the icemobile in unison, as our singing continues in flawless rhythm. This song is adapted from the original lullaby for this performance, and it’s only the first time I perform it before others. However, he’s able to just sing as though he’s a long-term partner, and even I enjoy singing before I enter the sub-chorus. Now, the light shall shine on me. The dazzling future, shall descend upon these hands. The world belongs to you, the future too belongs to you. To me, the one who loves you. The song ends. The audience replies with silence. At that moment, the cheers rain down like a torrent on us, as the audience get to their feet. This is a standing ovation. I did receive applause during the past Prayer Festivals, but this time, it’s exceptional. We’re basked in massive thunderous applause “Amazing!” “Riveting” with loud cheers, so loud that the ice ceilings appear to crack. Even when I had the special prize of the Prayer Festival sixteen years ago, I never had such a huge reaction. —But when did he memorize this song? —It’s a nice tune no matter how many times I hear it. I see. I recall. I recall myself singing the lullaby in the ‘Snow White’, and him watching on. —So that’s when he remembered. Eisbahn grins with glee, like a boy who succeeded with a prank. And as the award is given, there is thunderous applause in the arena. Still reeling from it, I receive the award for two on the stage. This is the first time I have won this title, and I never dreamed that I would be winning it with Eisbahn. I probably wouldn’t be able to do it alone, so I think as I can’t help but feel gracious towards Eisbahn. ‘I’m too tired’ however, he didn’t attend the award ceremony because of that reason, and it’s a pity that I couldn’t share the joy with him. I’ll hand him the prize later. The special award goes to the ‘Spearmint Genesis’ by the Ceolaria pair, the hard work pair goes to Vicia’s pair, and the ‘booby prize’ for the second worst act went to Daisy and Gappy. Daisy never returned ever since she left the arena in a huff, and Gappy’s still in the infirmary. It’s rare for both parties to not show up at the ceremony. And so, the Prayer Festival this year comes to an end. To me, this is undoubtedly more impressionable than any Festival in the past. Having won the ‘Grand Prix’, I can finally sing to the masters with my head held high—so I think. That night, I keep singing before the Snow White due to extreme delight. The Cradle our masters sleep in give off a little glint as it hears my singing. And so, this becomes the final Prayer Festival. What this became the final?